When you can measure what you are speaking about, and express it in numbers, you know something about it; but when you cannot measure it, when you cannot express it in numbers, your knowledge of it is of a meager and unsatisfactory kind; it may be the beginning of knowledge, but you have scarcely, in your thoughts, advanced it to the stage of science. For a few years, I've attempted to keep a budget. My initial attempt involved a spreadsheet that I updated every week with our expenses. This worked well until I forgot for a few weeks, and had a difficult time remembering what each of my expenses were for. I moved on to a powerful program called GnuCash. 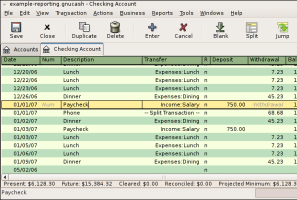 This free, open-source software has a very complete set of features around managing various accounts and budgeting. It is powerful enough for small businesses. It suffers, however, from some of the standard problems of open source software - an unintuitive, sometimes buggy design, and a few missing, vital, features. If GnuCash could automatically download the information from my financial institutions, and correctly handle cash transfers between them without a lot of work, I'd still be using it. As it was, I had to go to each financial website, download their data in a Quicken-compatible format, and import it into GnuCash. Very laborious, and it then duplicated any transaction that occurred between two accounts. I find this software very promising though, and will try it out again once they've taken care of a few of these basic issues. I would definitely recommend it for a small business however, where transactions would need to be entered manually anyway. It's reporting, budgeting and graphing capabilities are excellent. About a year ago, I began using Quicken Online. It is basically a much lighter version of their desktop software. It has a simple, very intuitive interface, and can handle basic budgeting tasks well. It can automatically download financial information for every account that I've tried, and does an excellent job of automatic categorization. 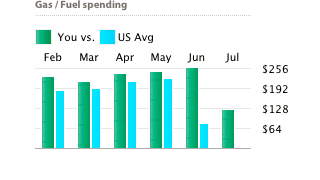 I can set up a budget, and view my spending trends. It only provides limited graphing of recent spending, but it is usually sufficient. This service recently became free, and would be especially useful for anyone who wants to be able to access the same budget information anywhere - there is even a mobile version. If being able to access the information anywhere is not as important, buying the desktop version of Quicken might make more sense - it is a very mature, powerful piece of software. For simple, low maintenance budgeting though, I can definitely recommend Quicken Online, with a few warnings. Intuit (the makers of Quicken) seems to have much more experience with desktop software, and they have somewhat frequent bugs in the Quicken Online software. This is a bit surprising though, given that they also make Turbo Tax, the online version of which is very stable. So, be prepared to have problems accessing your information for a few hours at a time every once in a while. Budgeting: Mint has far more flexibility, and can compare what you spend in different categories to average spending in different parts of the US. Very handy. As is usual, however, the user interface for this feature is definitely better on Quicken's site. Account management: Mint seems to be more powerful at importing information from financial institutions, but requires that you store answers to any secondary questions from your financial institution (ie, mother's maiden name) on the site. Quicken allows you to just enter it when needed, which is at least slightly better from a security perspective. Interface and Usability: Quicken Online is definitely better designed as far as the user interface. Mint.com's many features are a bit weird to navigate and poorly organized. Stability: In my experience, Mint has fewer bugs than Quicken Online, and less downtime. Other: Quicken is almost certainly losing money on Quicken Online. Mint.com, on the other hand, is working hard to advertise financial services on their site. They recommend bank accounts, credit cards and more based on your spending habits. I actually like this feature much of the time, since it attempts to recommend them based on how much money it would save. It's nice to see a list of checking accounts that you could use instead to be earning more interest, or which cash back credit card best fits your spending habits. Quicken Online's variety of bugs and frequent downtimes definitely make me lean towards Mint.com in general for flexible web-based financial software. If you don't mind not being able to access your information anywhere, and are willing to pay some money for the service, use Quicken or a similar program. If you have a Mac, however, be warned that the Mac version apparently has fewer features than the Windows version, while retaining the hefty price tag (and will soon have a different name). If you don't mind a little bit of extra work and love open source software, you might give GnuCash a try. If you don't like the way a feature works, you could always fix it yourself anyway. It's also a good way to get some geek street cred.